LivePerson Automotive | Dealer Chat & Text from Contact At Once! Dealer Chat & Text from Contact At Once! Contact At Once! provides an all-in-one mobile messaging platform to put your team in direct conversation with consumers wherever they’re searching, anytime they need you, no matter the device they’re using. Your team can answer or rely on our Live Advisors to respond on your behalf as needed. 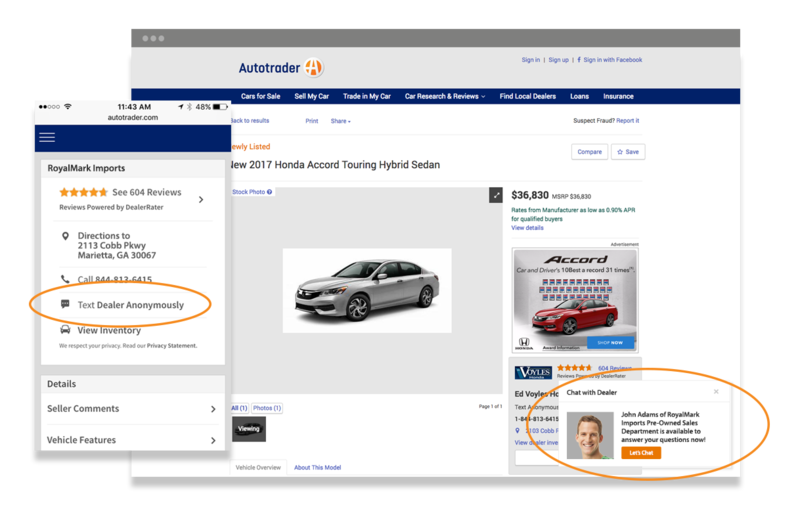 Live auto dealer chat enables your team to be there with real-time, on-screen help the moment car shoppers want it. Whether mobile or desktop, shoppers can instantly message a team member to get the answers they need to make decisions—like deciding to come into your dealership. 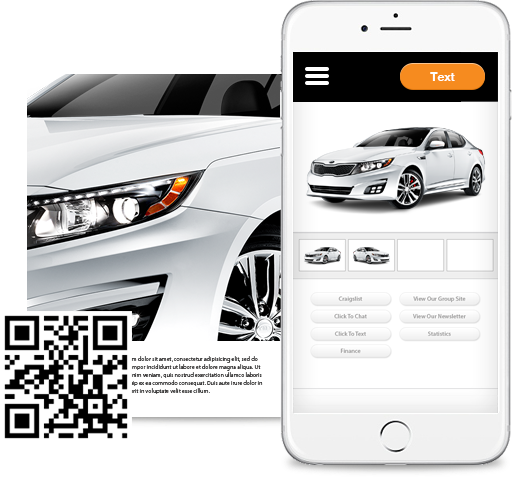 Let shoppers start automotive text conversations almost anywhere your inventory is listed, and empower your team to answer from any device...even record and text videos! This platform supports the latest in compliance assistance (with privacy regulations like TCPA), lead routing and secure, trackable mobile answering. Today’s car shoppers don’t keep regular business hours, but there’s no need to worry. Our mobile messaging solutions help your dealership be there, ready to help whenever customers reach out. From mobile apps so your team can respond at home to a team of dealer messaging professionals to answer on your behalf (up to 24/7), we’ll make sure you don’t miss an opportunity. Dealership websites, mobile sites, OEM sites, third-party ad listings, Apple Business Chat, Google My Business, Google AdWords, Facebook Marketplace, Facebook Messenger...wherever shoppers find you, they can chat or text with you in our cross-channel messaging network. Even better? Your team receives and responds to all those sales conversations through a single app! Team too busy to answer all those shoppers’ chat or text messages? We’ve got your back with up to 24/7 coverage from our managed chat platform! Answer when you can; we’ll respond when you can’t. Our highly trained team of customer care professionals specialize in mobile messaging, so consumers will get the service and immediate attention they want...and you don’t have to miss a conversation. 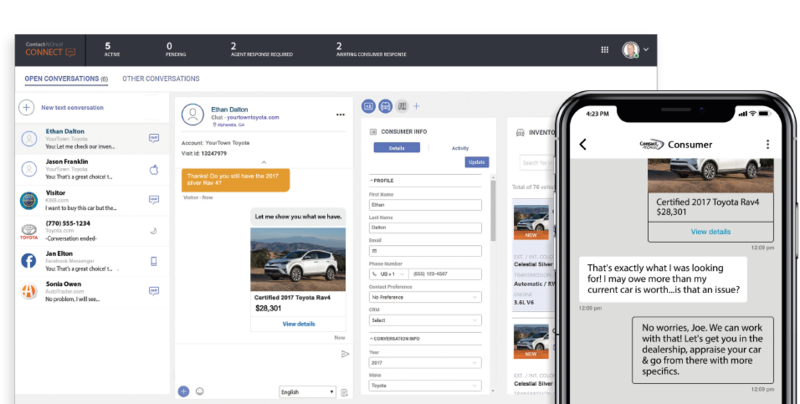 With built-in permission-based rules, automatic opt-outs, tracking, CRM integration and conversation transcripts, your dealership can access every contact, every message and more. Whether you need help with compliance management (like for the Telephone Consumer Protection Act) or quality assurance, we’ve got your back. And we already integrate with most leading industry CRM systems! We know how vital it is to gauge consumer website behavior using metrics that matter. Along with our own chat/text/messaging performance reporting, Contact At Once! has developed the most comprehensive approach to Google Analytics in the industry. Tracking 8 goals and 16 events allows us to show how messaging performs and relates to other website conversion and engagement metrics in an apples-to-apples comparison for true transparency. Shoppers can message you no matter the device they’re using to research (smartphone, tablet, desktop) and your team can respond just as seamlessly, no matter the device they’re using! Contact At Once!’s mobile and web-based apps make these instant connections possible. With Contact At Once!, we have the ability to respond immediately and provide the consumer with all of the information they need - in a matter of seconds - to help them make an informed decision. 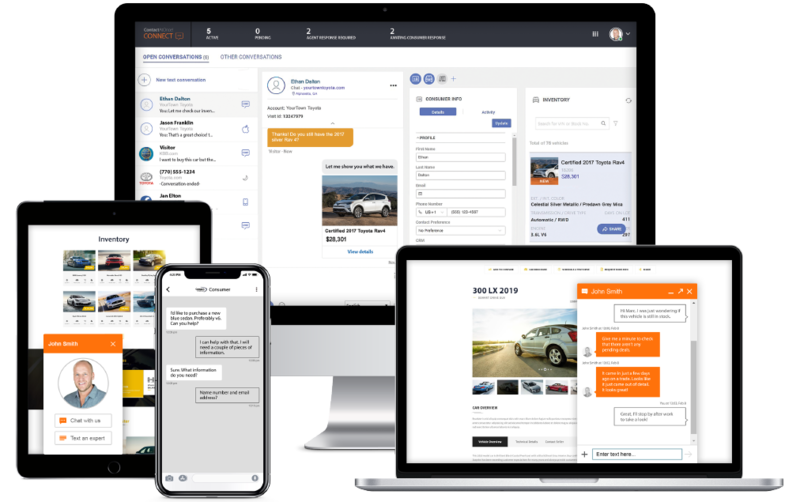 I have used several other chat solutions before, but we have seen the best results with Contact At Once!, a LivePerson Company: at least 5-8 cars sold per month (tracked to that solution) and a significantly improved customer experience. I love the ability to both self-manage and use a backup team that handles our customers like we would after business hours. I have even had sales agents text me, saying they were able to sell a car from their own couch! We use Contact At Once! messaging at three of our dealerships, and it is one of our best assets out of all third parties. Not only is it the way our customers choose to communicate with our staff for sales, parts and service, it is one of our premier sources for capturing data and selling vehicles. This month we had a total of 28 leads come to the CRM from Contact At Once! at one of our stores, and we closed 5 of them (17.9%). This is the highest closing percentage of any of our third parties. This tells me that Contact At Once! provides an access point to bottom-of-the-funnel shoppers for sales, oil changes and questions for our service department advisors. The service doesn't stop there: The Contact At Once! support team is always on target. They answer the phone and handle any issues or answer any questions I may have. For the price, the service and the performance, I couldn't ask for a better partnership with a third party. At Apple Automotive, we feel it’s important to create a ‘warm and fuzzy’ experience. Messaging gives us the ability to reach auto shoppers on their terms, and that’s an important start to the whole experience. By using Contact At Once! and bringing consumer awareness to this option, we have seen an increase in engagement at each of our stores.